What can the rocks in old stone walls tell us about how the earth's crust was shaped, melted by volcanoes, carved by glaciers, and worn by weather? And what can they tell us about earlier people on the land and the first settlers? These are the questions explored in the children's picture book Stone Wall Secrets, by Kristine and Robert Thorson. 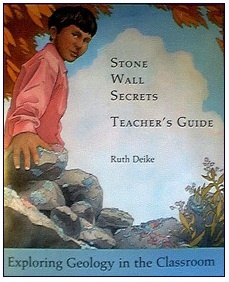 Stone Wall Secrets Teacher's Guide incorporates the imagery and discoveries of Stone Wall Secrets with hands-on classroom activities that illustrate basic earth science concepts. With explanations, language and activities that are fun to teach, this guide brings complex concepts within the grasp of elementary school students, encourages the process of discovery in young learners, and helps them find out how the world works. Science is exciting--as students discover though their own questions: Will we ever run out of air? Does the earth itch? Will there ever be another ice age? Why is the sea salty? How do we know the earth has an iron core? Author Ruth Deike spent three decades as a research geologist with the U.S. Geological Survey. She is the founder of Become a Rock Detective, a non-profit educational organization. Ruth brings boundless energy to teaching children about earth science and has learned that, what young Rock Detectives discover for themselves, they remember. The Stone Wall Secrets Teacher's Guide encourages exploration of subject matter that exceeds National Science Education Content Standards. Additional references for teachers and students, useful websites, a metric conversion table, and a glossary of terms make this a wonderful addition to any earth science curriculum.